It is always hard to part with a family pet. I had more than my fair share of dogs when I was younger. And they have all crossed over. Cindy has had Tybalt Capulet Kristofferson for seventeen years. That would make him nine hundred and nineteen, in human years. A centurion of a pet. 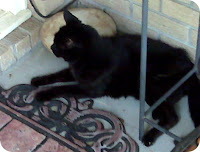 And all by his lonesome, he survived Katrina as the storm surge crept up 4 feet in the house. And he toughed out many long, un-air conditioned weeks of recovery with nary a complaint. Sadly, he hasn't been eating much lately. He's lost close to 20% of his body weight in recent weeks. He doesn't do much more than nap throughout the day. And I'd be hard pressed to remember the last time he was in a playful mood. So preparing his grave wasn't unexpected, but it wasn't the least bit pleasant. I started with a Tupperware box. Big enough to hold said cat. And big enough to show me how far to dig. (I figured twice the depth of the box would be sufficient. 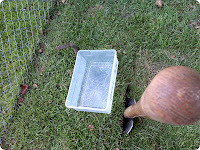 Once I had the faux coffin in place, I cut a single piece of turf with the tip of the shovel. I pried it up, and placed it to the side. In theory, after the ceremony, Cindy or her Mom would be able to cover the grave site with the still-intact grass. For the curious, seems like the turf was nearly ten inches thick. And it doesn't like being carved out with a shovel. However two hundred pounds of fatman can cut through protesting foliage easily enough. 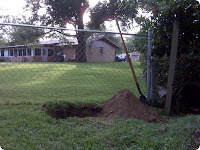 Once the chunk of greenery was removed, I set to work digging the rest of the hole. Fortunately I only encountered two notable roots. Unfortunately they were notable because they were the size of my wrist. And they squirmed when I tried to jumped on the shovel and cut through them. So I struck them with a two-handed, downward stabbing method. Miserable work. Extremely jarring to the wrists and my damaged shoulders. Not to mention the savage July heat. But after another hour, I'd managed to dig to a depth and width that contained the box more than twice its height, all below the grass line. I considered it a done deed. I took a break, observed my work, and snapped a self-portrait. 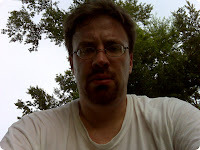 This is what it looks like to labor under a raging Mississippi sun. Note the multiple beads of sweat. The angry, solemn gaze. The soaking wet shirt. And that is how I dug Tybalt's Grave.